If there wasn't enough hysteria surrounding One Direction already, Zayn Malik just added to it. 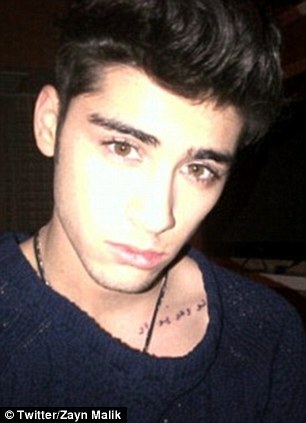 The 20-year-old whipped off his shirt and told his fans that he had added a new ink design to his already tattooed body. The good looking boy band member dropped into a tattoo shop, while on tour in New Zealand, to get his latest piece of body art on his neck. Malik posted a picture on his Twitter page showing off his bare chest next to a much larger and heavily inked tattoo artist. Although Zayn didn't reveal what the new design is, it is rumoured to be a silver fern, which is the national symbol of New Zealand. In the photograph the X Factor finalist is seen smiling proudly while wearing taping and bandages on his neck and shoulder. It was only at the start of this month that the teen heartthrob had another etching done on his left collarbone. The quiff haired star then told his budding followers the meaning behind the words. He tweeted: 'For every1 asking what the new tatt means it says be true to who you are'. The What Makes You Beautiful performer now has five tattoos in total including his grandfather's name on his chest in Arabic. He also has a Japanese symbol on his hip which means 'born lucky', and on his wrist he has the yin and yang symbol. While his band mates Harry Styles, Liam Payne, Louis Tomlinson and Niall Horan, all maintain their squeaky clean images, Zayn is fast becoming the badboy of the group. Last month he was spotted smoking a cigarette from his hotel window just hours before his band were due to perform at the Nickelodeon Kids Choice Awards. 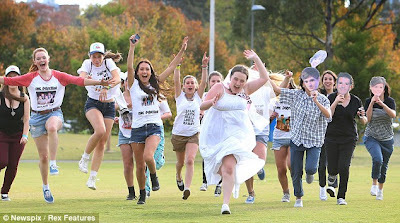 The boys have been causing a storm on their current promotional tour and greeted their Kiwi fans after hanging out in Australia.